(by Ron Lopez, Philippines’ ABS-CBN News and Reuters) MANILA – US President Donald Trump arrived in the Philippines on Sunday for meetings with his Asia Pacific counterparts, the last stop of his Asian tour. Before his arrival, Trump had met with President Rodrigo Duterte on the sidelines of the Asia Pacific Economic Cooperation meetings in Danang, Vietnam. Duterte hosted Trump and over a dozen other heads of government for the Association of Southeast Asian Nations and East Asia Summit (ASEAN). Trump’s Asian tour comes as the US rallies for tougher sanctions against North Korea’s nuclear program and ballistic missile tests. He was also keen on pushing fair trade with Asian countries. In a speech in Vietnam, Trump said he could no longer tolerate chronic trade abuses and would insist on fair and equal policies. 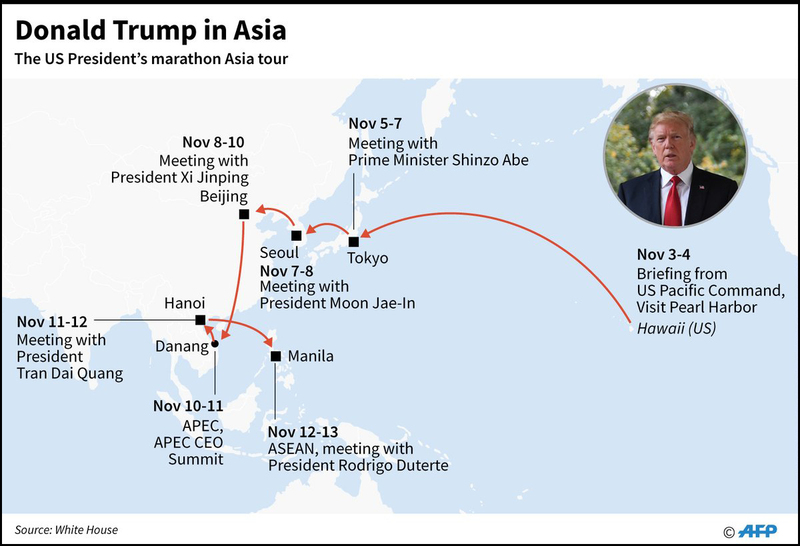 It was the last leg of a marathon Asia tour for the American leader that, despite Trump’s “America First” policy, may reassure some that his administration remains committed to a region that Beijing sees as its strategic domain. In Vietnam earlier on Sunday, Trump said he was prepared to mediate in the dispute over the South China Sea, where four Southeast Asian countries and Taiwan contest China’s sweeping claims to the busy waterway. But Duterte, host of two days of summit meetings that will bring together Southeast Asian and East Asian nations, said the thorny issue was better left untouched. All the claimants were at the summit, except for Taiwan. “We have to be friends, the other hotheads would like us to confront China and the rest of the world on so many issues,” Duterte said at a pre-summit business conference in Manila. Find the answers at the CIA World FactBook website. Choose the country from the drop down box. Answers can be found under the “Geography” “People” and “Government” headings. b) Watch the videos under "Resources" below. What is your reaction? a) Do an internet search for news reports on President Trump’s trip to Asia. Do media reports indicate that the president did anything right? Has he re-established the U.S. on the world stage? How do they frame his Asia trip? for each of the countries President Trump visited (Japan, South Korea, China, Vietnam, Philippines)? How many headlines with a negative tone do you find?